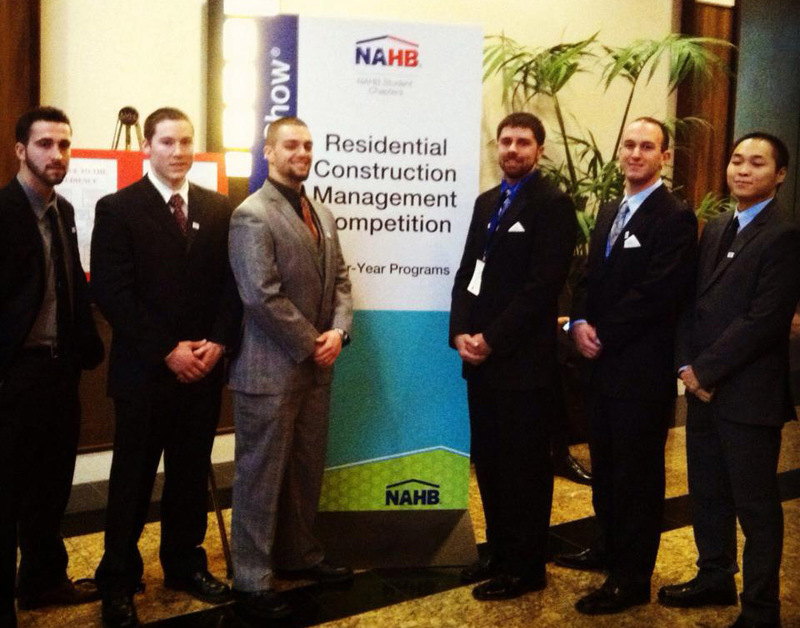 This past week, the UMass chapter of the National Association of Homebuilders travelled to Las Vegas to compete in the Residential Construction Management Competition, a star feature of the International Builders’ Show. This was UMass’ first time ever being represented at the RCMC after many past chapters had tried to complete the project, but failed due to lack of organization and funding. The Residential Construction Management Competition requires each student chapter to play the role of a construction company and develop a fully comprehensive development proposal for a real plot of land in the United States. This year the site was a 60-acre plot of land in Aurora, Colorado, just east of Denver. The UMass Chapter, also known as Minuteman Construction Co., proposed a 40-home neighborhood targeting the move up market (household income $80,000-$100,000) that focused on affordability, sustainability, and connectivity. Co-presidents Tom Bliss and John Coroa were the only returning members to the chapter this year after the disappointment of having to withdraw from the competition last year. But this only fueled them to learn from their mistakes and come back strong. Together, they made the project into a 2-credit BCT course that met for two hours each week. This helped to draw in hard working students that shared their desire for success. Along with Bliss and Coroa, Dylan Bachand, John Yip, Frank Kelly, Evan Miamis, and Ben Murphy worked hard to achieve the chapter’s goal of completing the 100-page proposal and travelling to the IBS in Las Vegas to present it before a panel of construction professionals acting as the primary investors for their development, Coal Creek Acres. The other chapter members who contributed to this project are Sam Shepherd, Matt Mullan, and Chloe Rutkowski. Success on this project is not only owed to those who did the work, but also to the NAHB’s generous sponsors who helped by donating money to fund the trip. These include the BCT program, Market Basket, and Chili’s of Hadley. 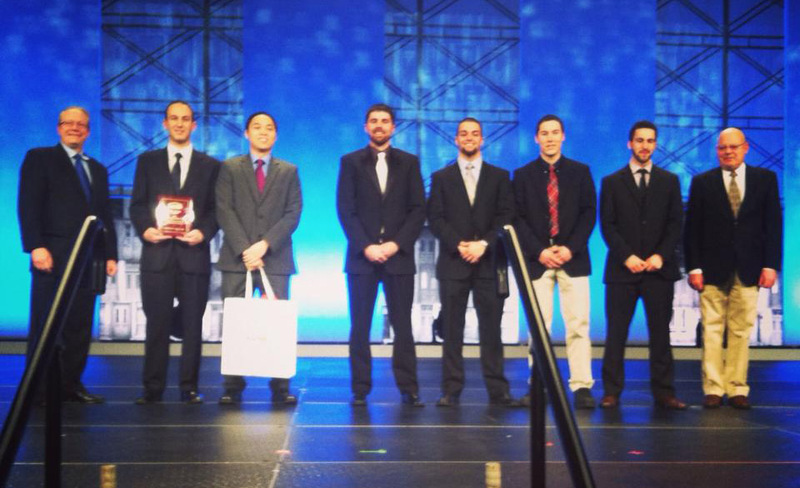 After the UMass NAHB’s 5+ months of hard work, they were rewarded at the RCMC Awards Ceremony with the Rookie of the Year Award. All five judges agreed that for it being UMass’ first year participating in the competition, they did outstanding and included things in their proposal that the judges had never seen before. All seven of the members at the show agree that it was a once in a lifetime experience that cannot be beat. The UMass NAHB wants to give a very special thank you to the Homebuilders and Remodelers Association of Western Mass for their continued support of their chapter. The two organizations have stuck together over the years of the UMass chapter’s existence. They have assisted the UMass chapter with meetings, funds, shop tours, community service opportunities, and anything else the students have needed. The team is proud of what they accomplished at the 2014 RCMC and excited to return next year with all of the experience they have gained and take home first place.